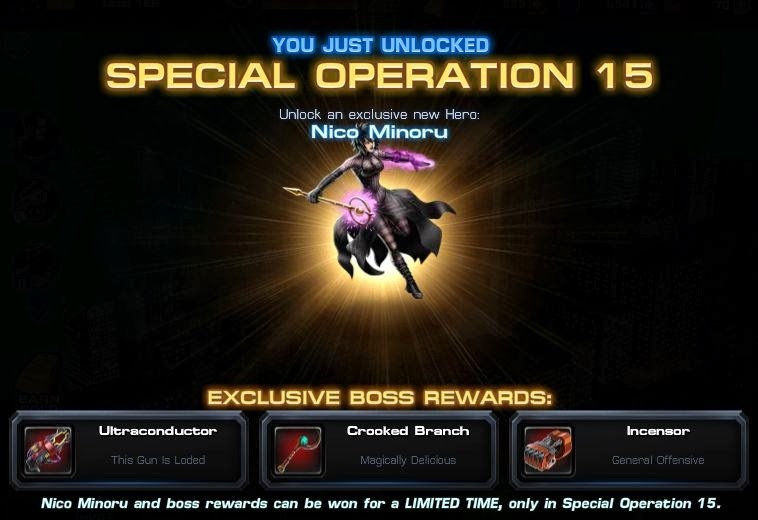 ooh neato: Marvel Avengers Alliance: Spec Ops 15 Begins! Patch Notes! Marvel Avengers Alliance: Spec Ops 15 Begins! Patch Notes! 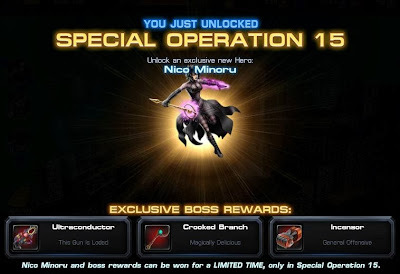 Spec Ops 15 launched today for Marvel Avengers Alliance. It's a lesser known storyline this time around featuring the villain Arcade as both the main boss and group boss. Up for grabs for finishing your Spec Ops tasks is Nico Minoru. If you manage to collect enough Lockboxes for luck to win out, you can also get Moonstone. Arcade has used powerful nanotech to turn half of New York into his own private playground... and we're his toys. He's arranged a game of heroes versus former villains, with the Agent invited to be Player One. Bio – The Pride was an organization of six supervillain married couples, dedicated to the destruction of all of humanity... except for their own children. Those children would prove to be their undoing, becoming a group of young heroes known as the Runaways. The leader of the Runaways is Nico Minoru, daughter of two evil sorcerers, and a powerful magician in her own right. She wields the Staff of One, a mystical weapon which allows its wielder to cast almost any spell they can imagine... but only once. Move 2-A: Die in a Fire! Move 3-D: Rock And Roll! Raised in a wealthy family, Arcade grew from a spoiled, selfish child into a sociopathic killer. His love of toys became an obsession that inspired the creation of "Murderworld"; a deadly funhouse where trapped heroes become toys for Arcade's amusement. Arcade drops Psycho Lockboxes when you fight the Group Boss. Our newest lockbox hero is Moonstone! She can be recruited by completing the Psycho Lockbox collection. In addition to group boss drops, players can earn Psycho Lockboxes from a 6-part Spec Op side task, or by buying them in the store. Bio : Dr. Karla Sofen originally became a psychologist not to help others, but to manipulate them. When the original Moonstone became her patient, Karla convinced him to give up the Kree Lifestone he had stolen. Karla then absorbed the stone herself, gaining the powers of flight, intangibility, gravity manipulation, and more. Her recent signs of reform may be genuine... or may simply be another psychological power play. The Incapacitation Debuff should now be working as intended. HYDRA Burners can now properly be found in Season 2: Chapter 3, Mission 6, and all other instances of HYDRA Burners in the game have been tagged to count toward the Chapter 3 "Partners in Crime” task.